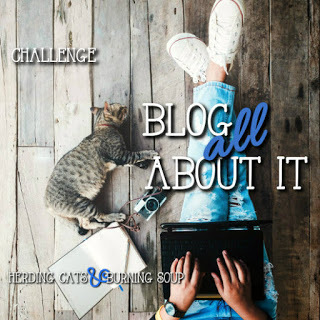 Welcome to my first post of the year of the Blog All About It Challenge. This is the beginning of my second year participating. Very simple! Each month I take the word prompt for that month and create a blog post of anything I want using that word. 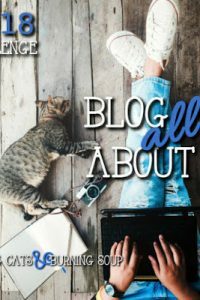 My personal goal for participating in this challenge is for you to learn a bit about me each month. I could have displayed an absolute hoard of my contraband sweets that are never in short supply around the place. You all already know I love chocolate so I steered away from candy as my choice. I also thought about sweet romance books or books/songs with SWEET in the title (humming Sweet Caroline now). However, I wanted to share something that might be new material for you. I’ve never really discussed my taste in movies so I chose to tie that in with the prompt this month. Mostly, I prefer mysteries, costume dramas, comedies, spies, thrillers, sci-fis, paranormals, and sagas, but, on occasion, I want to watch an adorable not terribly complicated romance or a simple, feel-good movie like Second Hand Lions or Driving Miss Daisy… the sweet ones in other words. So, here is my small collection of SWEET feel-good movies. I think Sandra Bullock is my favorite actress for these sweetie types, but I don’t really have a favorite actor for these. What about you? Do you like SWEET feel-good movies? If so what is/are your favs? Do you have a favorite actress or actor for this type of movie? Do tell! Oh yes, Princess Diaries 2. I’ve not watched Legally Blonde yet. Good picks, Renee! Yes! Now and then, they hit the spot. Oh yes, Hugh Grant is in several of these that I like. I’m a big lover of movies like, Sleepless in Seattle, Pretty Woman, While You Were Sleeping, You Got Mail, Dirty Dancing, and so many others I can’t even think of. BTW I also loved Second Hand Lions and bought it as soon as it was released to buy. Also Driving Miss Daisy. I think I have seen all of these numerous times. The older I get, the more I want to watch sweet rather than dramas-although I love stuff like Walking Dead and Stranger Things! I love mysteries and thriller, but a nice chick-flick, or romance hits the spot too. You’ve displayed a few of my all-time favorites: You’ve Got Mail, Sabrina, and A Room With a View! *sigh* Love those so much! I totally blanked on a few of these prompts. LOL Hope you come up with one. Feel free to snitch mine. I loved A Room With A View as teenager and had such a crush on Julian Sands in that role! I’m not sure if I ever risked reading the book in case it wasn’t like the film! That has been one of my favorites from the first time I watched it. I think I smiled through the whole thing. 🙂 Thanks, Angie! I love sweet movies too! My favorites are When Harry Met Sally, and The Notebook! I love all of the Meg Ryan movies, and Sandra Bullock is one of my favorite actresses for sweet movies as well! Yep, the easy watch without much thinking or deep feeling is what draws me to them as well, Di. 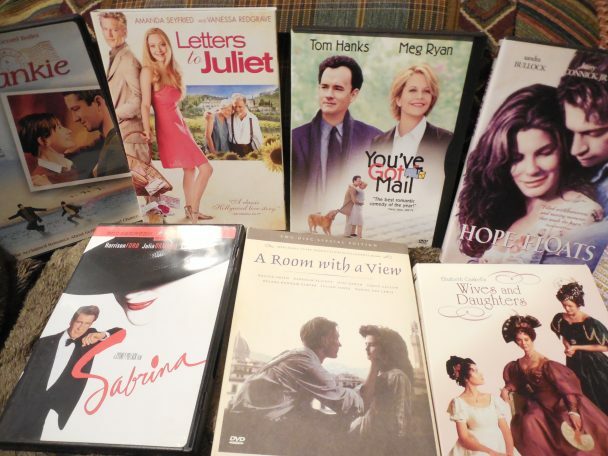 Yes, I love Julia Roberts’ sweet movies along with Meg and Sandra. Miss Congeniality was a hoot. Haha, yeah good luck avoiding those GoT spoilers. I thought one of the gals at work was going to leap across the table and strangle another gal for spoilering one of the shows. YOU’VE GOT MAIL! I am always surprised that it’s not on every book blogger’s Valentine’s Day movie list. It’s the perfect bookish movie. I know, seriously! Small indie book store vs. big goliath chain store and an online romance? Perfect!